The North Sea now accounts for 90% of all global offshore wind power generation, but will soon face a challenge from China, it has emerged. An offshore innovation report by the International Renewable Energy Agency (IRENA) claims that current data shows “90% of global installed offshore wind capacity is in the North Sea”. 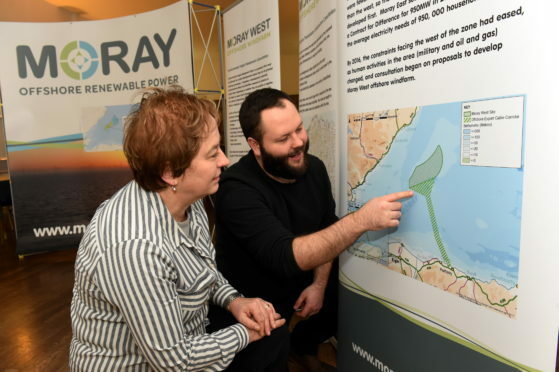 The report comes as a Moray Firth wind developer revealed yesterday its upcoming windfarm will be able to “meet the needs of 40% of Scotland’s households”. Moray East Offshore Windfarm added that it will also generate power at almost two-thirds less the cost of current UK windfarms. The development, due to begin construction in 2022, is expected to power more than 950,00 homes. Construction of Moray East will be quickly followed the Neart Na Gaoithe project build in the Firth of Forth. A spokesman for Moray East Offshore Windfarm said: “Our facility will be able to provide, certainly on conservative estimates, power to meet the needs of 40% of Scotland’s households. The IRENA report found that, as “pioneers in the sector”, the UK, Germany and Denmark now stand as “established leaders” of the offshore wind sector. But it added that the North Sea’s dominance could soon be eclipsed by China which has “recently emerging as a key player”. The IRENA report provides background and recommendations to policy makers in the G7 on how to step up progress and meet climate goals utilising renewable energy. The research firm added that due to the decreasing cost of electricity, many new projects “can often now compete directly with fossil fuel-fired electricity”. Stephanie Conesa, policy manager at Scottish Renewables, said: “This new data proves, once again, that the UK plays a massive part in the growing international offshore wind industry. “The developments and research taking place in the UK have placed us at the very forefront of offshore wind innovation and cemented our reputation as a global hotspot for renewable energy.